He is Deputy Director General at Assonime (the Italian Association of Joint-Stock Companies) in charge of corporate governance and capital markets Unit. 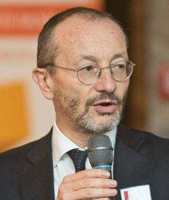 He is the coordinator of the Technical Secretariat of the Italian Committee on Corporate Governance and member of the board of European Issuers (pan-European organisation representing the interests of publicly quoted companies across Europe). At Consob from 1990 to February 2016, he worked on supervision (Head of Corporate Governance Division), regulation (Head of the Regulation Impact Analysis Unit and Head of the Regulatory Strategies Division), research (Head of Statistic Unit), and internal administration (Head of Human Resources Division). From 2007 to 2017 he was Chairman of the OECD Corporate Governance Committee. He was Chairman of the Working Group on Company Law at the European Council during the Italian Chairmanship (second semester 2014).